This week we have been practicing running around the streets for cross-country. It has been tiring and fun at the same time, for the last three days we have been running around the streets 2-3 laps. The people who are always in front could do 3 laps, if we didn't want to then we could just do 2 laps. 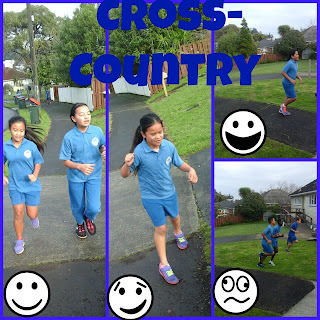 When it comes to the final cross-country, then we have to do 3 laps around the streets. Here is a collage of room nine running.